The bowler who spun New Zealand to their incredible victory in their first Test against Pakistan has vowed to keep the pressure mounting on the home team ahead of the second Test that’s taking place in Dubai. 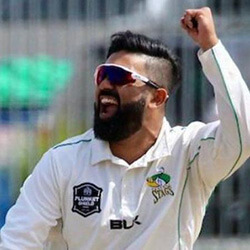 Left-arm spinner Ajaz Patel had a stunning start to his Test career, claiming 5-59 n Abu Dhabi and helping New Zealand claim a memorable four-run win after setting Pakistan a 1786-run target. The 30-year old, who was given the man of the match award for his performance in Dubai, has said that keeping up the pressure in the test is the key to continuing their victory. Pakistan have been hit by criticism in the way they handled their batting, which saw the team throw away their last seven wickets for just 41 runs, and the Black Caps are currently preparing for the backlash. Another win for New Zealand would translate to their first series victory away to Pakistan since Graham Dowling led them to 1-0 triumph in 1969. Patel has said that New Zealand has a long tradition of fighting hard, and that the team will always go out and fight, regardless of whether they are chasing or defending a large or small total. Patel, who was born in Mumbai before moving to New Zealand at six-years-old, was selected for the tour after his performance for Central Stages last year after he took 48 wickets. He will be playing again next year when India tour New Zealand. New Zealand are set to host teams from Asia, including India, Bangladesh, and Sri Lanka during the 2018-19 home season that will be played from December to March. The India ….